In the 1970's Steve Prchal, Assistant Curator of Small Animals at the Desert Museum, discovered an interesting tarantula on Mesa del Campanero west of Yécora, Sonora. (Prchal later founded Sonoran Arthropod Studies Institute) He sent a preserved specimen to the tarantula monographer Andrew M. Smith in England, who described the new species Aphonopelma moorei in 1994. Enigmatically he dubbed it the ‘Sonoran copper head’ even though the thorax is metallic green and ‘copperhead’ more commonly refers to the pit viper of the southeastern United States and northeastern Mexico (Agkistrodon contortrix), a relative of the tropical pichecuate (A. bilineatus) which reaches its’ northern range limit in southern Sonora. 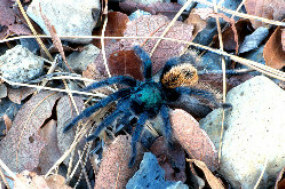 The Madrean green tarantula is a better common name (not that most invertebrates have common names). Photo: R. L. Bellsey from near the type locality on Mesa del Campanero, Sonora. In late summer butterflies are abundant and diverse in all habitats from the tropical lowlands to the montane forests in the Sierra. 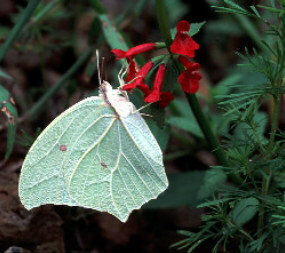 Butterflies are especially common visiting the various red-flowered plants in the oak woodlands and pine-oak forests. Here, a sulphur butterfly (Pieridae) is visiting Texas betony (Stachys coccinea). Photo: Z. Liu. 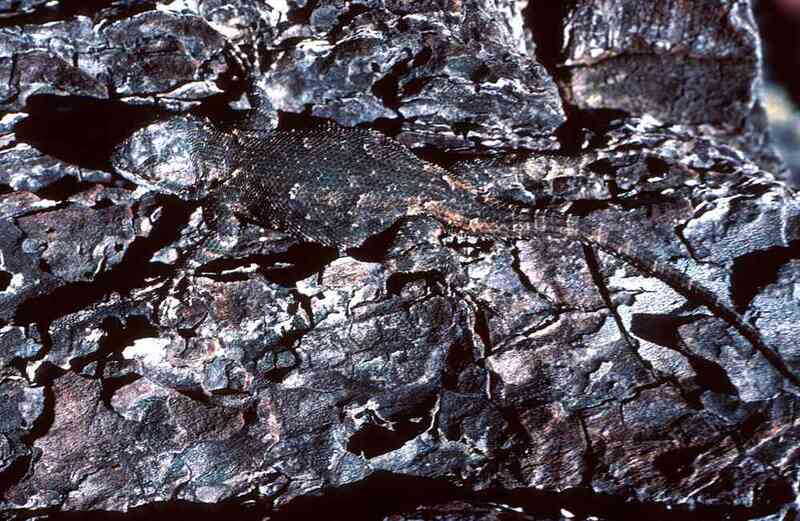 Field parties from the University of Arizona lead by Charles H. Lowe discovered the first population of a new lungless salamander (Plethodontidae) about 21 km west-southwest of Yécora on rainy nights in September of 1964. 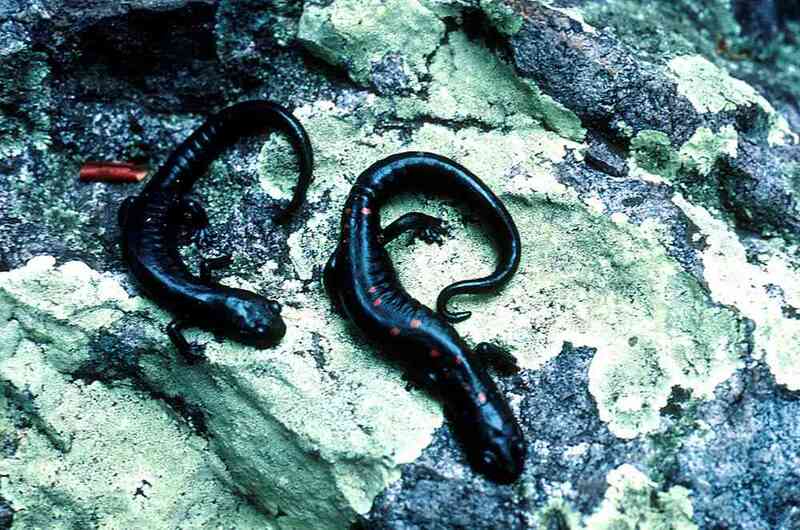 The salamanders were in wet logs in the steep, mesic, shady canyons in pine-oak forest east of Santa Ana on the old road from Nuri to Yécora on the west side of Mesa del Campanero. 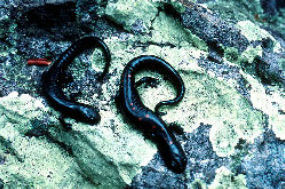 The specimens were described as the pine-oak salamander (Pseudoeurycea bellii sierraoccidentalis) in 1968. In 1987 Tom Van Devender discovered a second population near Ocampo, east of Yécora. These populations are almost 900 km north of the nearest population of the nominate subspecies (P. b. bellii) in the Sierra de Nayarit. Photo: E. T. Nichols from near Ocampo, Chihuahua. Left: The Mexican Plateau toad (Bufo occidentalis) lives in rocky habitats in pine-oak forest in the Sierra Madre Occidental and was reported as far north as Chihuahua. Observations from Mesa del Campanero, Arroyo El Reparo, and west of Yécora are the first records for Sonora. Photos: (top) R. L. Bellsey from Mesa del Campanero, Sonora; (bottom) G. M Ferguson from west of Yécora. 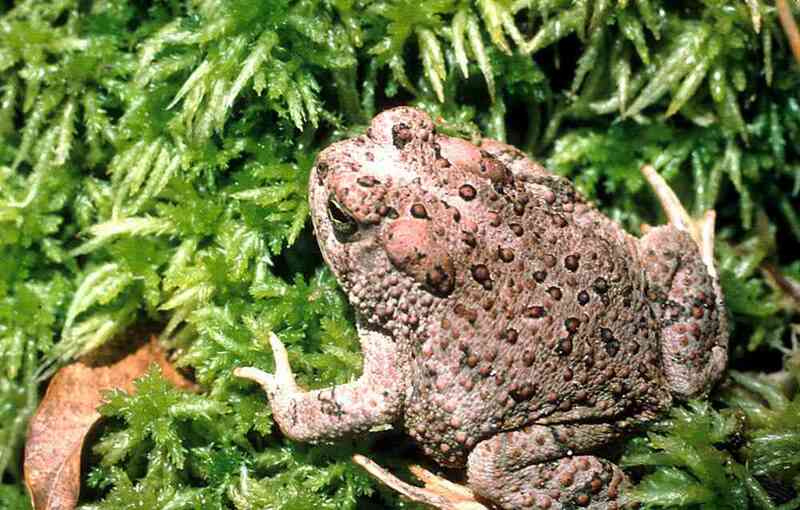 The Mexican toad (Bufo mexicanus) is common in the pine-oak forests in the Sierra Madre Occidental in Durango and Chihuahua. 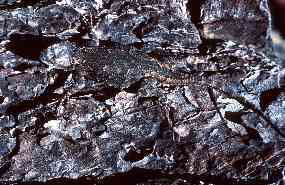 In Sonora, it is found in the Yécora area, and probably other mountains to the north along the Chihuahua border. 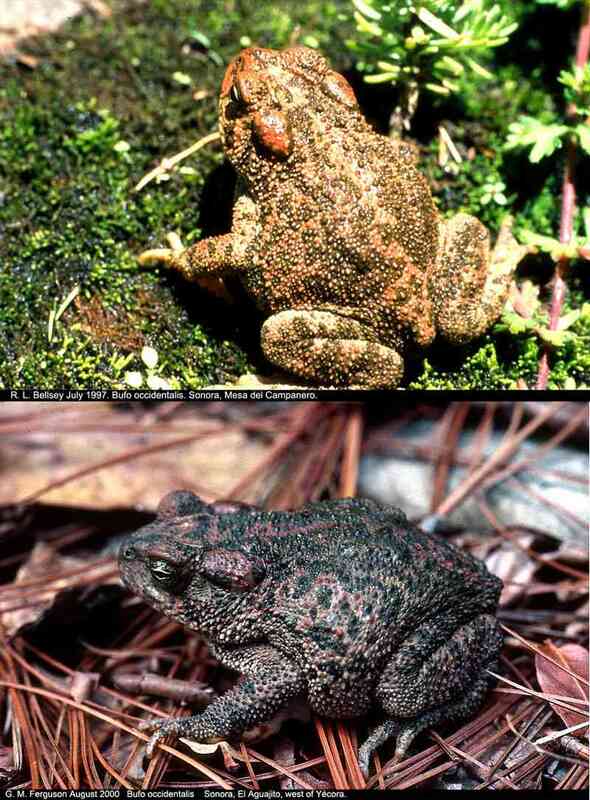 It is geographically separated from the closely related Arizona toad (B. microscaphus) found from southwestern New Mexico northwest along the Mogollon Rim into southern Nevada and southwestern Utah, and the California toad (B. californicus) in southwestern California and northwestern Baja California. 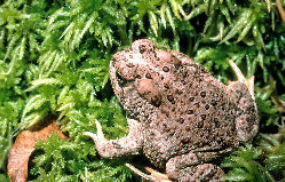 Intermediates between the Mexican and southwestern toads are found in foothills thornscrub near Masocahui in central Sonora Photo: G. M. Ferguson from the Ciénega de Camilo, east of Maycoba, Sonora. 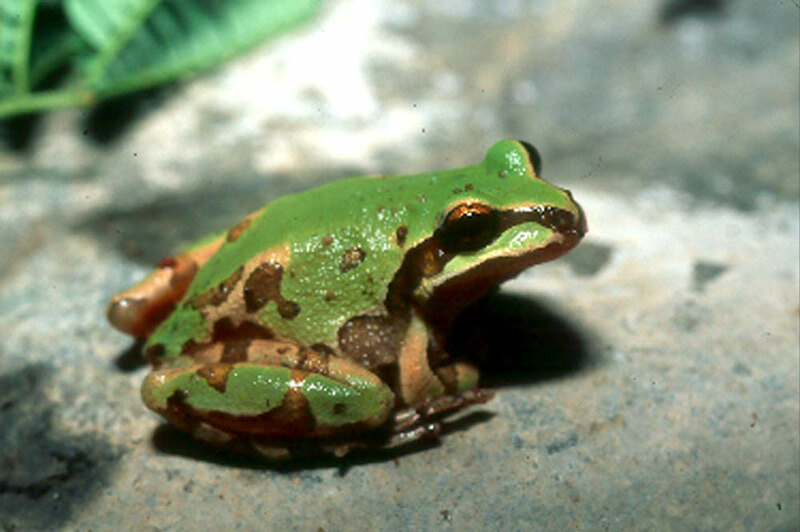 The mountain treefrog (Hyla wrightorum) is closely related to and was previously considered a subspecies of the more southerly H. eximia. On rainy nights in August and September these little green frogs forage in the Yécora area in large numbers. 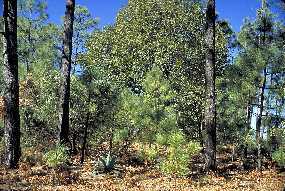 There are isolated northern populations in the Huachuca Mountains and on the Mogollon Rim near Flagstaff. Photo: R. D. Bartlett from near Yécora. 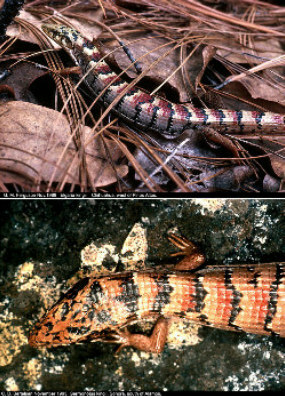 The alligator lizard (Elgaria kingii) occurs in oak woodland and pine forest from Durango and Sinaloa northward to central Arizona and southwestern New Mexico. 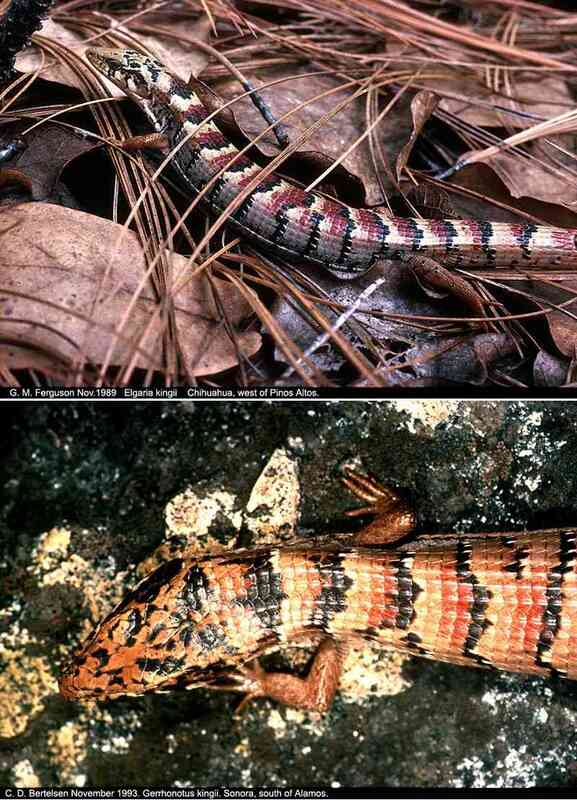 In eastern Sonora, the Madrean alligator lizard (E. k. kingii) is replaced by the Arizona alligator lizard (E. k. nobilis) north of Yécora. One animal was seen in tropical deciduous forest near Santa Ana southwest of Yécora. 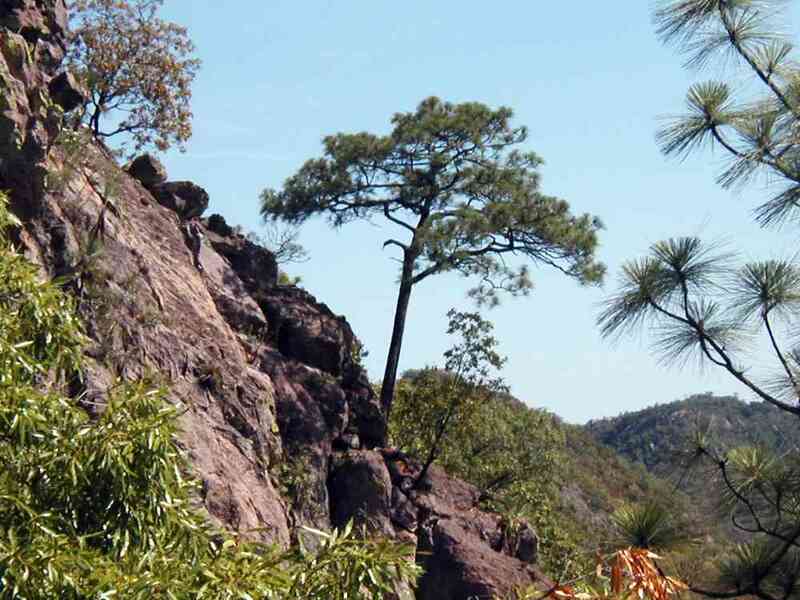 There is an isolated population on the Sierra de Alamos in southern Sonora. Primitive alligator lizards (Anguidae) were common in early tertiary tropical forests long before the formation of the Sierra Madre Occidental in the late Oligocene-early Miocene (30 to 15 million years ago). Photos: (top) G. M. Ferguson from near Pinos Altos, Chihuahua; (bottom) C. D. Bertelsen from the Sierra de Alamos, Sonora . The mesquite lizard (Sceloporus lemosspinali) is widely distributed from Oaxaca in southwestern Mexico north to extreme southern Texas and Chihuahua. Specimens observed in pine-oak forest on the Mesa del Campanero above Yécora are the first records for Sonora. Like the tree lizard (Urosaurus ornatus) of lower elevations, the mesquite lizard is a cryptic species that is perfectly camouflaged on tree bark. Photo: G. M. Ferguson. Slevin’s bunchgrass lizard (Sceloporus slevini) is found from northern Durango through the Sierra Madre Occidental to southeastern Arizona and southwestern New Mexico. 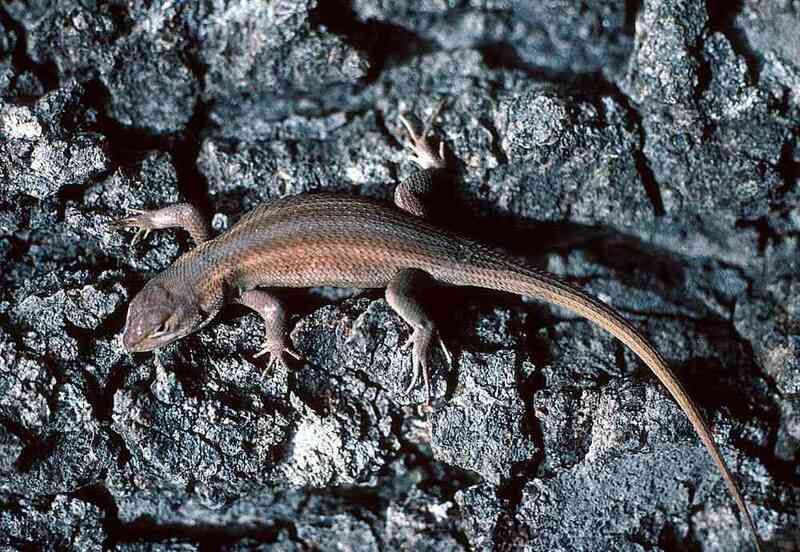 This heavy-bodied little lizard lives in high-elevation woodland and forest up 11,000 feet and in plains grasslands as low as 4300 feet. It is surprisingly agile and hard to see or catch in bunch grasses in open meadows. Bunch grass lizards have two very different color forms. 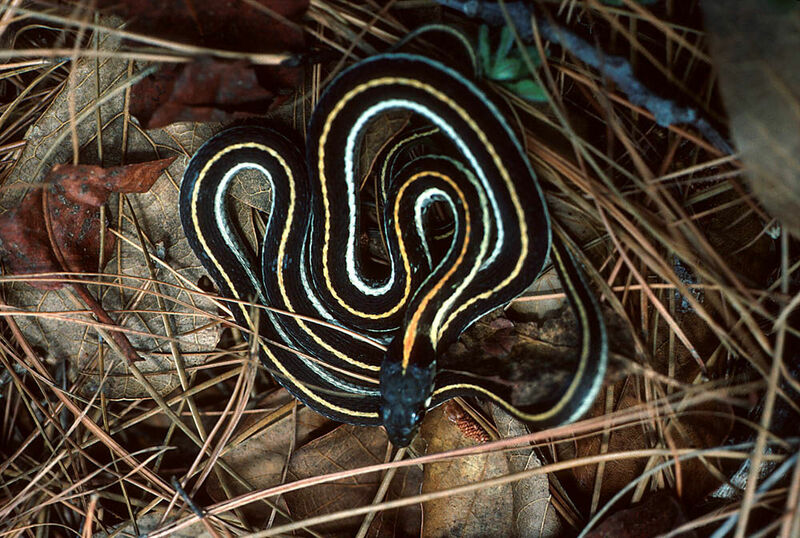 In one there are rows of crescentic dark blotches and bright white lateral dorsal stripes. The specimen pictured here from Mesa del Campanero, Sonora, has relatively little dorsal color pattern. The striped plateau lizard (Sceloporus virgatus) occurs from western Chihuahua and eastern Sonora in the northern Sierra Madre Occidental north to southeastern Arizona and southwestern New Mexico. 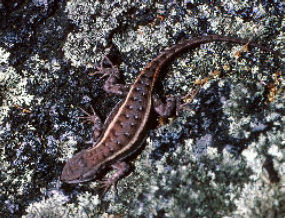 Formerly, it was considered a subspecies of the widespread fence lizard (S. undulatus) which occurs from coast to coast with various subspecies. 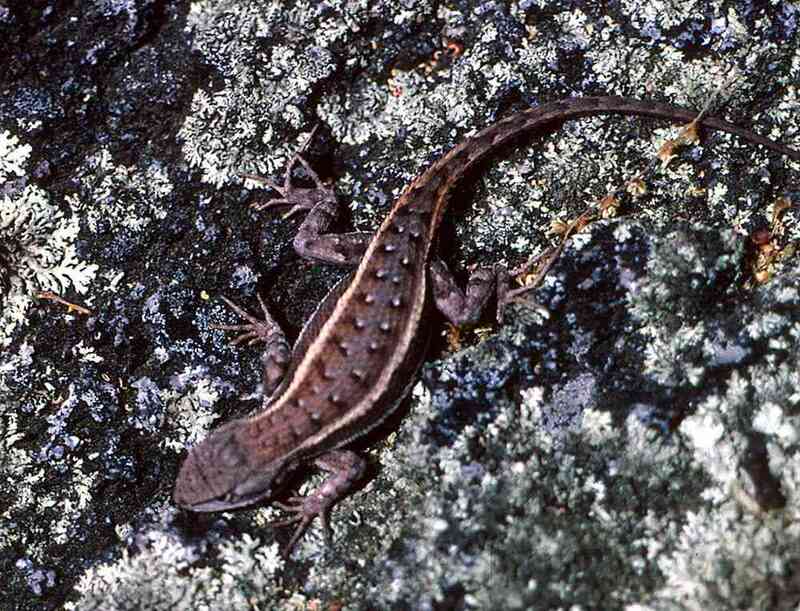 It especially resembles the southwestern fence lizard (S. cowlesi) but has a stronger striped pattern. The common name is a misnomer because it does not live on the Colorado Plateaus to the north in Arizona. 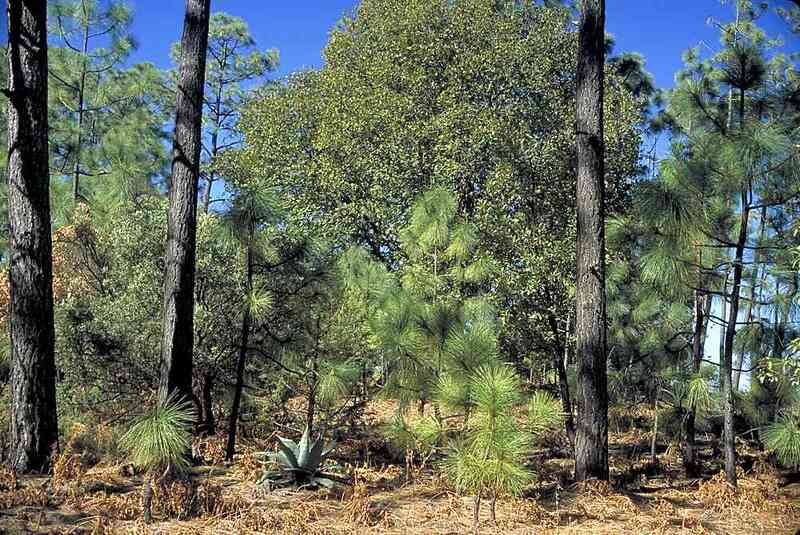 It is a species of the oak woodland and lower pine-oak forest. The mountain skink (Eumeces callicephalus) is found in montane habitats from southeastern Arizona and south into the Sierra Madre Occidental in Sonora and southward. 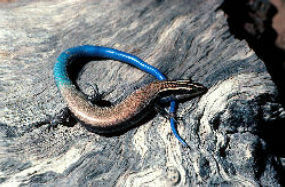 Like many tropical animals, the mountain skink is found primarily in rocky stream canyons in oak woodland in the Madrean sky island ranges in Arizona in the northern part of its range, but is much more widespread in various habitats from the tropical lowlands to montane forests in Sonora. This smooth lizard easily escapes predators by ‘diving’ into leaf litter or leaving behind its writhing blue tail as a distraction. Photo: R. W. Van Devender from Arizona. 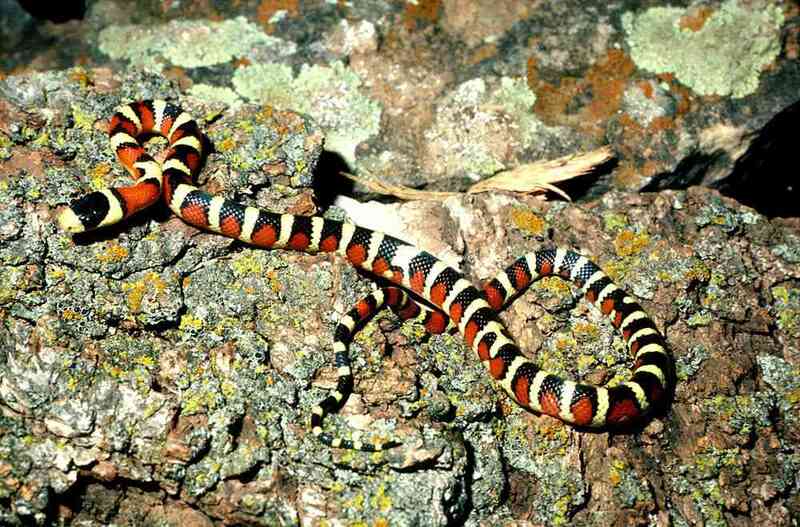 The Sonoran mountain kingsnake (Lampropeltis pyromelana) is a brightly-colored diurnal snake that lives in rocky canyons in woodlands and forests from Utah south through Arizona and southwestern New Mexico into northeastern Sonora and northwestern Chihuahua. 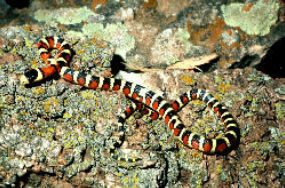 Although it is similar in color pattern to the California mountain kingsnake (L. zonata), the Sonoran mountain kingsnake is likely a northwestern relative of the Mexican kingsnake (L. mexicana) complex which has a series of colorful geographic subspecies from Texas south to central Mexico and back northwest to Durango. During the 1970s and 1980s various Mexican kingsnakes were heavily collected and extensively bred in captivity. 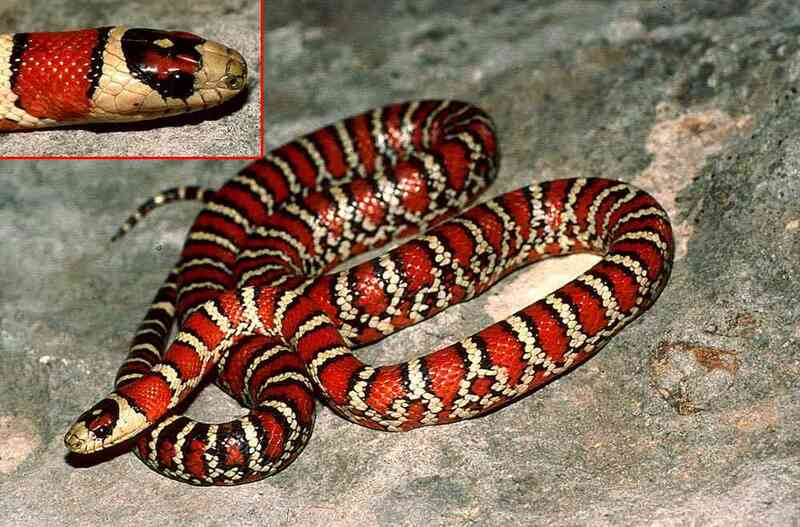 The nominate subspecies of the mountain kingsnake (L. p. pyromelana) pictured here is typical of southern Arizona animals although the width of the red bands and number of triads are variable within populations and among different sky island populations. Another subspecies characterized by fewer triads and thus more red was named L. p. woodini in honor of Bill Woodin’s (the Museum’s second Director) research on mountain kingsnake taxonomy and ecology. Photo: J. S. Applegarth from Santa Rita Mountains, Arizona. 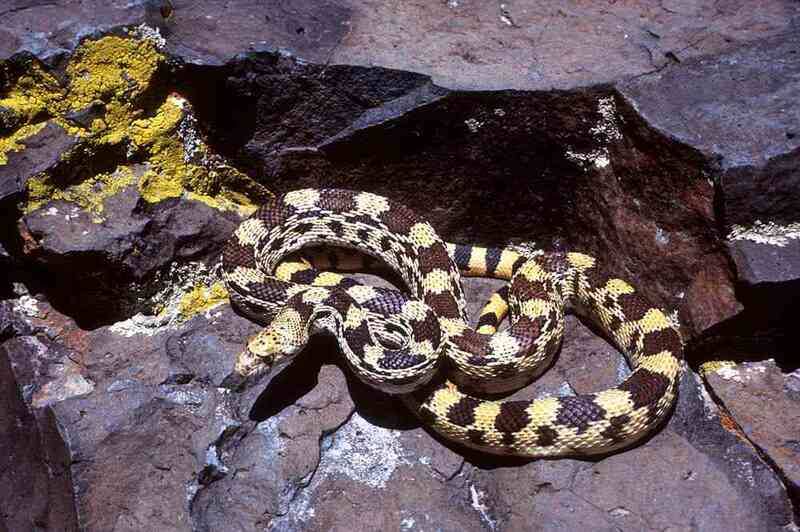 The Madrean mountain kingsnake (Lampropeltis pyromelana knoblochi) in the Sierra Madre Occidental in Sonora and Chihuahua with high numbers of triads scalloped white lateral lines below the triads is the most distinct subspecies of mountain kingsnake. 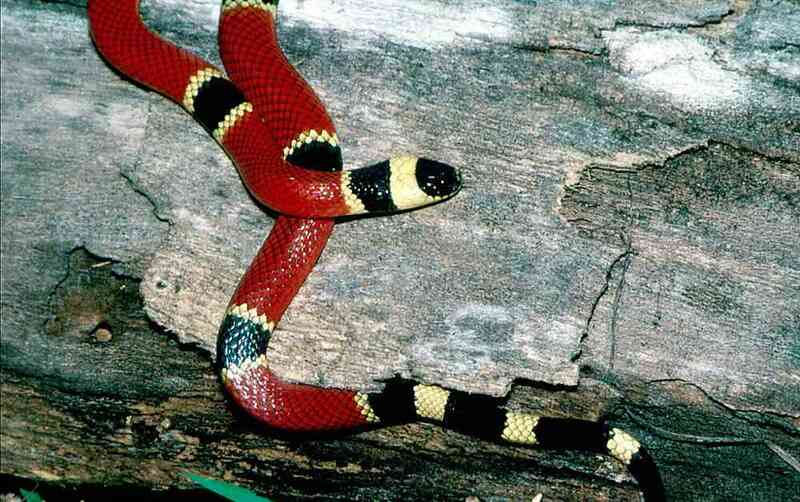 The Yécora area in eastern Sonora may be the only area where mountain kingsnakes (supposed mimic) and the west Mexican coral snake (venomous model) could actually be found close to each other. Photo by R. W. Van Devender of individual from near Yécora, Sonora. 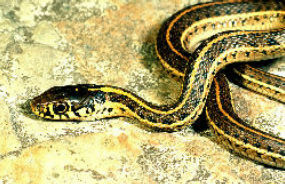 The Mexican gartersnake (Thamnophis eques) is found Oaxaca north to southeastern Arizona and adjacent New Mexico. The northern subspecies (T. e. megalops) is widespread in Chihuahua and Sonora. In 1950 Bill Woodin, future director of the Desert Museum, reported that the Mexican gartersnake was common in irrigation canals along Rillito Wash north of Tucson. Later its range in Arizona contracted to just a few populations in three southeastern counties and it is a species of conservation concern for Arizona and Pima County. Another subspecies with a thin middorsal stripe and dark ground color (T. e. virgatenuis) is found in the Sierra Madre Occidental in west-central and southern Chihuahua is expected to occur in Sonora. Photo: R. W. Van Devender from the Canelo Hills, Arizona. The black-necked gartersnake (Thamnophis cyrtopsis) is a common, widespread snake found near streams in rocky canyons throughout the southwestern U.S. and northwestern Mexico. Photographed near Yécora by G. M. Ferguson. 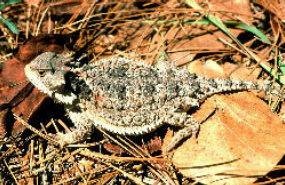 Sierra Madre horned lizard (Phrynosoma orbiculare) is found from Puebla in south-central Mexico north to the Laguna Babícora, Chihuahua. Observations of the northern subspecies (P. o. bradti) from east of Yécora are the first records for Sonora. It lives in pine-oak forest in our region. 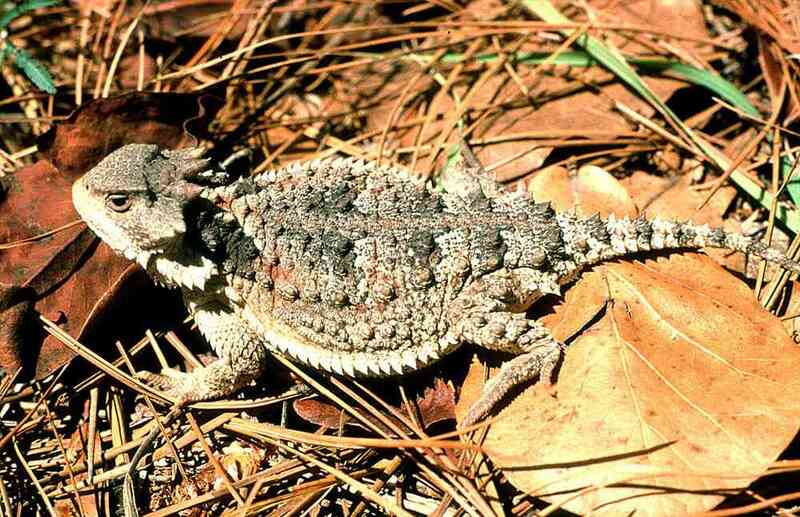 This species, the closely-related short-horned lizard (P. hernandesi), and the more distantly-related rock horned lizard (P. ditmarsi) are unusual for the genus Phrynosoma because they are ovoviviparous (the eggs are retained inside the body until hatching and the young are born alive). Photo: G. M. Ferguson from east of Yécora, Sonora. 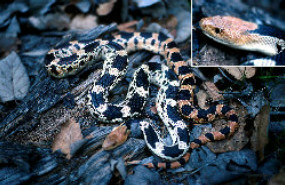 Above two images: Pine snakes (Pituophis melanoleucus) in the eastern United States and the closely related gophersnakes (P. catenifer) are widespread across the continent with many geographical subspecies, mostly recognized by different color patterns. The víbora sorda in the Sierra Madre Occidental with contrasting black and white blotches on the anterior body grading to rich yellowish brown posteriorly, and a peach colored head is especially handsome. The populations between Madera, Chihuahua, and Yécora probably warrant recognition as a new subspecies. 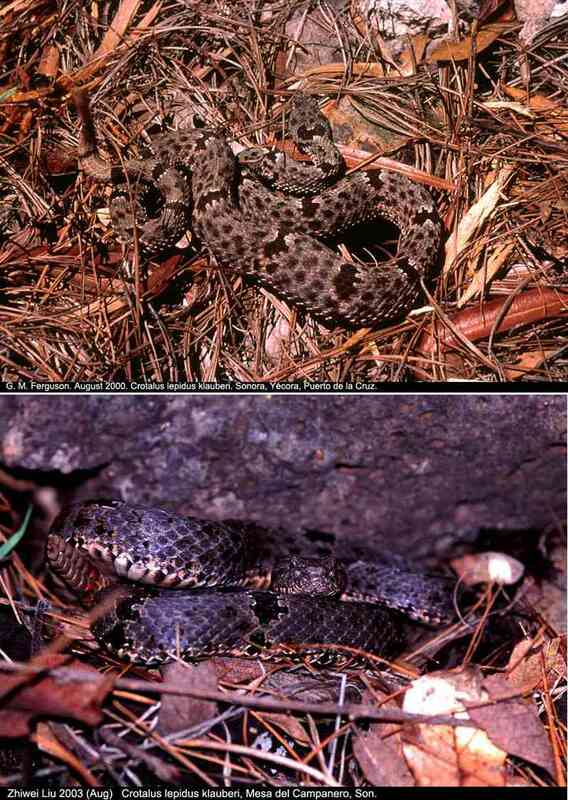 Left: The color patterns of black-tailed rattlesnakes (Crotalus molossus) are well known for matching rocks in different geographic areas and in general a docile disposition. Animals are gray in limestones in the Chihuahuan Desert in western Texas, greenish in the Chiricahua Mountains, yellow in the Huachuca Mountains, and brownish in desert ranges in Arizona. 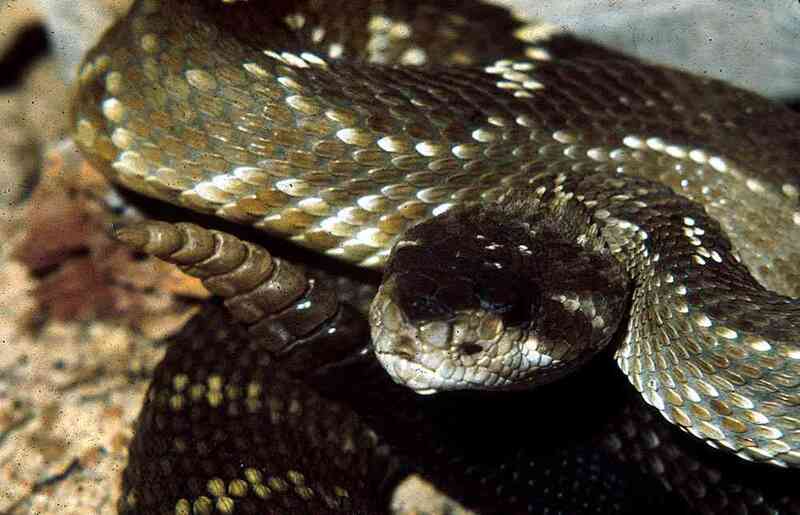 In the Sierra Madre Occidental in eastern Sonora and western Chihuahua, the Madrean black-tailed rattlesnake (C. molossus nigrescens) has a rich dark brown color and a more irritable disposition. The tail can be black or charcoal gray with black rings. Photo: R. W. Van Devender from Yepómera, Chihuahua. Above: In the Yécora area the small montane species of rattlesnakes (Crotalus lepidus, C. pricei, and C. willardi) are called chichámoras. This is likely a Mountain Pima variant of cacámuri or tcatcámuli, as they are called by the Tarahumara in Chihuahua. Rock rattlesnakes (C. lepidus) are well-known for population color variations including whitish, tan, reddish, etc. that match the local bedrock. 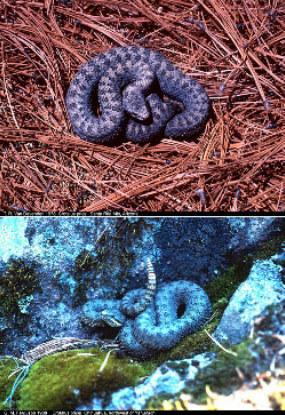 In the banded rock rattlesnake (C. l. klauberi) males in many populations have reduced mottling, strong cross bands, and a greenish ground color. On Mesa del Campanero above Yécora, banded rock rattlesnakes match the bluish-black of the basalt rocks. Photos: (top) G.M. Ferguson; (bottom) Z. Liu. 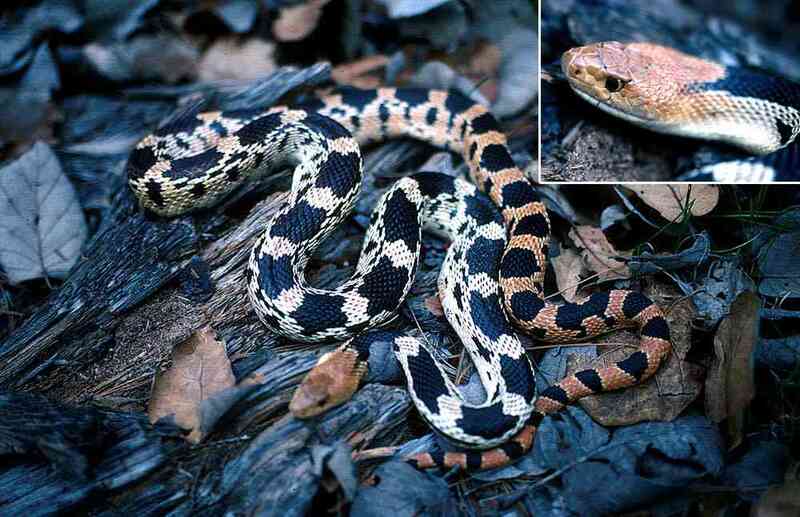 Above: Except for the pygmy rattlesnakes (Sistrurus miliarius) in the southeastern United States, the twin-spotted rattlesnake (Crotalus pricei) is the smallest North American rattlesnake, and the one that lives in the highest (up to 3180 meters), coldest habitats. Its’ tiny rattle sounds more like an insect buzzing than a rattlesnake. It usually is a gray snake with two rows of small spots down the back. 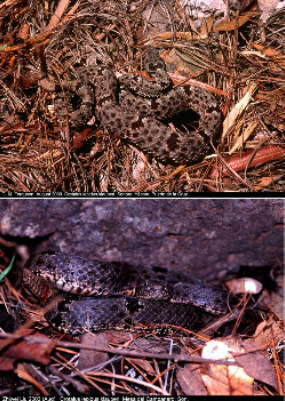 The western twin-spotted rattlesnake (C. p. pricei) occurs in the Sierra Madre Occidental from Durango north to southeastern Arizona. Another subspecies (C. p. miquihanus) is only found on Cerro Potosí in Nuevo León in the Sierra Madre Oriental in northeastern Mexico. The northernmost population in Arizona is in the Graham Mountains. 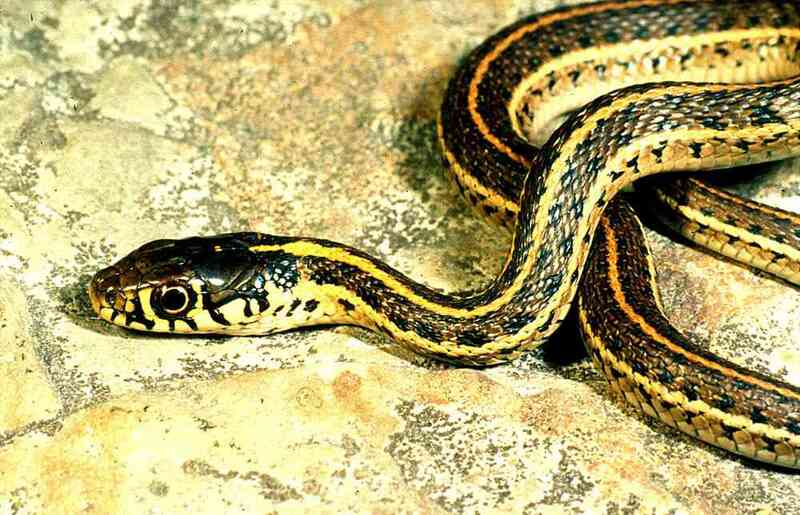 Here it lives with the southernmost population of the wandering gartersnake (Thamnophis elegans vagrans). 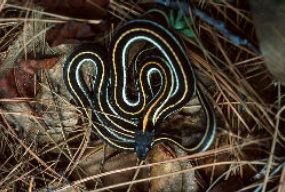 Their color patterns are so similar that at least one unwary botanist was bitten by a twin-spot thinking it was a gartersnake. 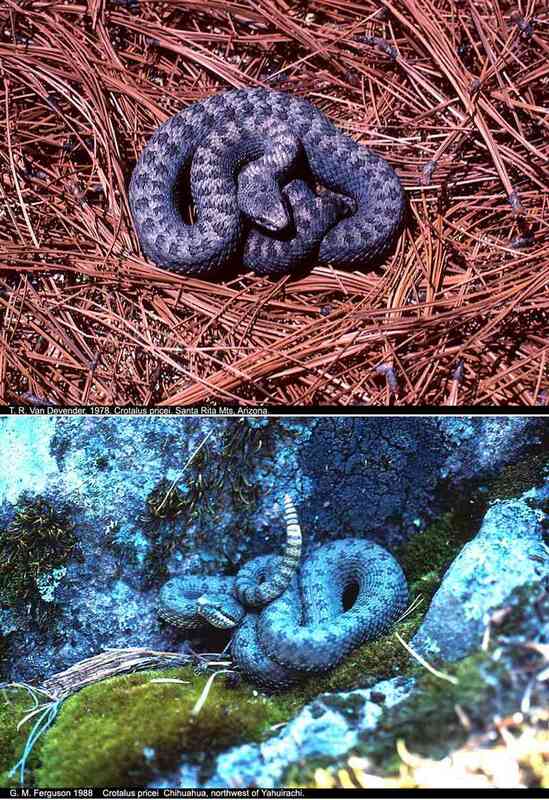 Photos: (top) T. R. Van Devender from the Santa Rita Mountains, Arizona; (bottom) G.M. Ferguson from the Chiricahua Mountains, Arizona.